Choosing the right shampoo for your child’s hair is an important decision, as using the wrong one could lead to irritation of the scalp and could cause the hair to stop looking its best. That’s why we have scoured the market to find the very best shampoos for children, and reviewed them here for your convenience. You will also find some helpful tips about looking after your child’s hair, to ensure it always looks and feels great. 2.0.2 How Often Should You Wash Your Child’s Hair? 2.0.3 What are the Best Brands of Kids Shampoos? When buying your child a new shampoo, there are many things for you to look out for. Harsh chemicals and toxins being one of them. If you purchase a shampoo that is not made from natural or organic products, it could be very harsh on their skin. Look out for shampoos that do not have artificial fragrances or colors. When you buy shampoo, always do a patch test on your child’s skin a few hours in advance. You also need to think about their hair type and what shampoo is suitable for them. Buy a shampoo that labels as ‘strengthening’ or protective. This shampoo is for kids for all hair types. It retails at an affordable price. This product removes chlorine green, minerals, and sea salts gently and is fantastic for lake, ocean and pool swimmers. Your hair is left silky soft and restored from the moderate, gentle fruit extracts. Lemon, grapefruit, and natural orange flower extract cleanses damaged hair and makes it fresh looking again. Fairy Tales Sun & Swim Shampoo detangles all hair types and makes it super soft with vitamins, and minerals. The shampoo is free from sulfates, harsh chemicals, parabens, and toxins. It is also nut, dairy, soy, and gluten-free! The Shea Moisture hair care twin pack retails at a moderate price and is good for thin, thick or curly hair types. It is a mango and carrot conditioner and shampoo duo set that straightens, smooths and softens your hair with powerful and safe moisturizing ingredients. Carrot oil leaves your hair with a wonderful and healthy shine. It has a lovely smell that your child will love and is the perfect conditioner for de-tangling knots. It has a fresh smell that will last for days until their next wash. The conditioner delivers nourishing hydration for dry hair and strengthens your child’s curls. It is paraben and sulfate free with no harsh chemicals or toxins and is safe for daily use. Children of all ages can use these products for healthy, glossy hair. 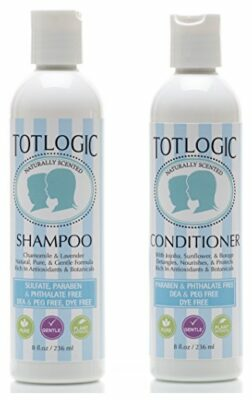 TotLogic Sulfate and Paraben Free Shampoo is safe for all hair types and retails at an affordable price. It is a combo set that cleanses dry scalp and hair for children and adults. This product is vegan and cruelty-free and made from natural plant-based ingredients, essential oils, and natural botanicals. This is the best natural shampoo for kids as it has no added toxins or harsh chemicals. It is very rich in antioxidants and easily rinses away, cleanly. The conditioner is great for detangling and strengthening hair. This is the best dandruff shampoo for kids with all hair types including curly and frizzy hair! This shampoo is extremely affordable and is great for protecting and nourishing damaged and dry hair. Anti-dandruff shampoo was designed for kids. It is very safe to use on a daily basis and protects their dainty scalp from dandruff flakes. This product does not contain any harsh chemicals or toxins, nor does it contain any artificial colors or fragrances and only contains safe natural ingredients. It is specifically made for sensitive skin and does not leave any irritation. Parents have highly recommended this shampoo and say it is very effective. 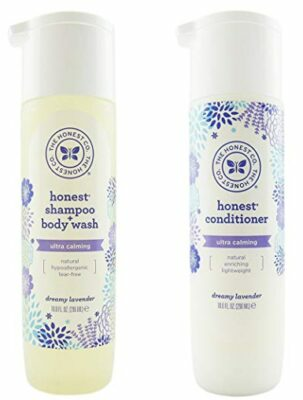 Aussie kids is a shampoo, conditioner, and body wash trio for kids with all skin types and it retails at a moderate price. This product has no harsh chemicals and washes oily, grimy hair fantastically. Parents have highly rated this pack of shampoo and say it has a nice strong scent that their kids love. Kids look forward to bath time and buying all your bathing products in one go will save you trips to the store. 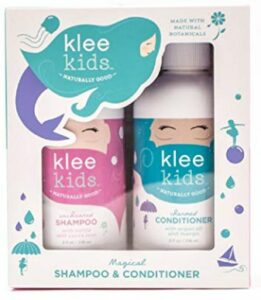 Luna Star Klee Kids Haircare Set is a shampoo and conditioner duo set for all hair types. It is retailed at a moderate price and is scented with orange peel, lemongrass, and lavender essential oils. It is even gluten-free and has no added artificial fragrances or colors. This haircare set is organic and has no harsh toxins or chemicals for the child’s delicate skin. The conditioner is excellent for detangling knots and parents say brushing their children’s hair is much more stress free. This product is a 3 in 1 soap that contains shampoo, body wash, and bubble bath. It is retailing for a very cheap price and is suitable for all skin types. Orange and lavender essential oils are mixed together to make bath time calm. Rich bubbles are derived from coconut oil and make an extra layer of foamy bubbles. Vitamins E and B5 are also added to provide extra nourishing moisture to the skin. White tea, chamomile, calendula, and EO organic herbal blend of aloe extracts gives a super soft and smooth touch to the skin. This product is cruelty-free, gluten-free, and recyclable. There are no artificial colors or fragrances added and is safe for daily use. If you are looking for the best shampoo and conditioner for kids, this twin pack is a strong contender. It is also retailed at an extremely affordable price. The lavender essential oil is very calming and makes bath or shower time fun, quick, and easy. The shampoo and body wash is hypoallergenic and tear-free. Both products are made from all natural ingredients and are cruelty-free with a fresh scent. The conditioner is very lightweight and is excellent for removing knots and frizzy hair. There are no harsh chemicals or toxins and it is brilliantly safe for daily usage. This product retails at an exceedingly cheap price and is made for all toddlers and young children. It is tear-free and gently cleans delicate skin with organic and natural ingredients. This duo set does not have any harsh chemicals, is free from synthetic fragrances and is perfectly safe for daily use. It leaves your child’s skin feeling super smooth and soft. It is excellent for babies with sensitive skin, allergies or eczema. 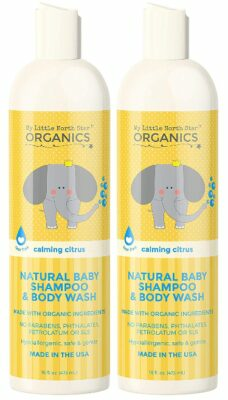 This baby shampoo is 100% vegan and the shampoo bottle is even biodegradable! Bathtime kids is a natural shampoo set for kids with all hair types and retails at a very affordable price. Pure essential oils and extracts give off a naturally fresh scent, there are no artificial fragrances or colors added. This shampoo is perfectly safe for everyday use and leaves your child’s hair extra soft, shiny and clean. It is made with organic fruit and plant extracts, vitamins, and soothing botanicals that nourish and protect your child’s hair. It is extremely high in quality and has no harsh chemicals. This product is cruelty-free and vegan, and one of the best organic shampoos for kids. Natural head lice shampoo treatment for children and adults has added tea tree oil, lavender oil, and rosemary for healthy hair growth. It is chemical free and has no harsh ingredients. This shampoo is said to be the best hypoallergenic alternative for healthy hair and sensitive, delicate skin. 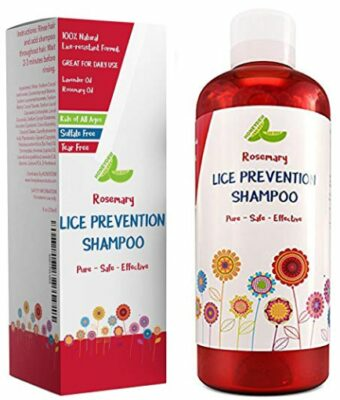 It prevents headlice and promotes long, thick, healthy hair. Aromatherapy formula repulses head lice and leaves your hair smelling super clean and fresh. Pure oil extracts repair dry and damaged hair and gently cleanses your scalp. It also calms you and soothes your skin. This shampoo will leave you with moisturized, smooth, soft, silky hair and scalp. 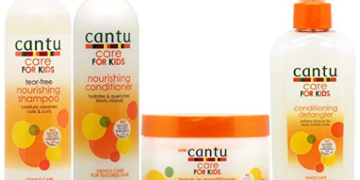 Cantu Care is a shampoo and conditioner set for kids with curly or wavy hair. It retails at a good price and contains shampoo, nourishing conditioner, leave-in conditioner, and conditioning detangler. The shampoo is tear-free that cleanses and promotes thick shiny hair growth. It contains the perfect mixture of coconut oil, pure shea butter, and honey formulated with no harsh ingredients. It gives curls and waves a beautiful shine. The conditioner adds healthy moisture and glow. It nourishes curls and waves which keeps the hair hydrated. The detangling conditioner softens hair strands for easy brushing, it nourishes curls and reduces hair breakage. The leave-in conditioner deeply conditions your child’s hair and reduces frizz. It also moisturizes fragile coils to stop them from breaking. Parents who have purchased this shampoo set have highly rated it and said that it leaves a healthy looking glow. Suave Kids is a 2 in 1 shampoo which also contains conditioner and is retailed at a reasonable price. It is tear free and made for all children’s hair types. It is a soft, creamy formula that reduces split ends and leaves your child’s hair feeling soft and smooth. This shampoo deeply cleans your hair and scalp and does not leave any flakes or dandruff. It is the perfect shampoo for clean, soft and silky hair. 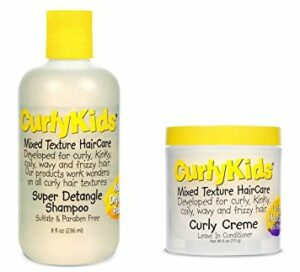 CurlyKids haircare is a super cheap and affordable bundle for curly, wavy, or frizzy hair. The detangling, creamy conditioner and shampoo has a mild scent and is tear-free. Parents who have purchased this product say it has left their child’s curls extra soft and smooth. It is a great product that leaves hair with a shiny, silky look. Everyone 3 in 1 Shampoo, Body Wash and Bubble Bath is a good shampoo for kids, because it is reasonably cheap and is perfect for all hair and skin types. It contains vitamins B and B5 and is extremely nourishing on the skin. It is also cruelty-free, gluten-free, and recyclable. It is 100% vegan and leaves your child with extra soft and smooth skin. 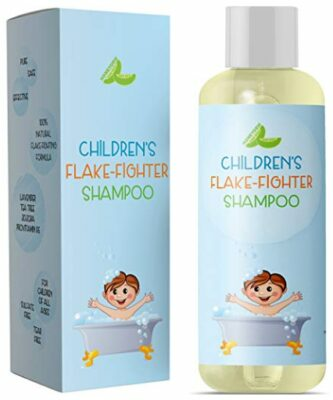 There are no synthetic colors or fragrances added into this set and it is perfectly safe for daily usage, which is why we have chosen this as the best shampoo for children’s hair. Use a gentle shampoo. Once your child is old enough to keep water and shampoo out of their eyes, then you can begin to use adult shampoo. Look for a shampoo that with a pH no higher than 6. HThe higher the pH, the drier your child’s hair will get. If your child has long hair, it is important for you to use detangling conditioner and detangling spray. Never put any type of conditioner on the child’s scalp. When detangling hair, begin from the bottom and work your way up. Always detangle curly hair when it is wet. It is important for you to give your child regular hair cuts. Frequent cuts will keep heir hair super healthy and will remove split ends. Every child’s hair is completely different. You should consider how often your child’s hair needs shampooing and how quickly it gets dirty. What is their hair type like? Is it curly, oily, straight, dry? Unless your child’s hair is dirty or oily then three times a week is a perfect amount of times to wash it. It is unnecessary and not the healthiest to wash it every single day. Always make sure you wash out the shampoo properly. If you leave any behind, it will cause their hair to become dirtier very quickly as it gives dirt and grime something to stick to. What are the Best Brands of Kids Shampoos? There are hundreds of different shampoo brands. You need to find what shampoo is best for your child. Shea Moisture Mango and Carrot kids are one of the best-branded shampoos you can buy. It strengthens, smooths and softens your child’s hair and leaves a sweet fruit smell all day long. It is exceedingly moisturizing and nourishing and the perfect shampoo for kids with curly hair. Suave Kids is another popular and good brand for shampoo. They have 2-1 formulas which makes hair washing much quicker, it is also tear-free. Their products leave your child hair very healthy and reduce split ends. It is also super cheap and affordable.